Bergonia at a glance -- basic facts and figures. Also see the site map for a complete list of topics. "Diversity" in Bergonia: a topical discussion of how Bergonians have dealt with their ethnic diversity. detailed descriptions of the various regiona, states, cities and localities. Population of the States, broken down by Language, a chart. The 2000 census found that 171,106,228 people live in Bergonia. The 1990 census found that 169,600,000 people lived in Bergonia. The growth rate is less than 1%. When Christopher Columbus discovered Bergonia in 1496, Bergonia had a native population of approximately 65,000,000 people. The vicious plagues brought by the Europeans reduced the native (atrei) population to a low of approximately 9,000,000 in 1620 or so. At the same time there came European settlers in considerable numbers. The population-- especially the atrei population-- started rapid growth in the mid 1700s and continued rapid growth throughout the 1800s. Parallel to the demographic trends in Western Europe and Japan, the rate of growth abated in the early half of the 1900s and flattened in the second half. Unlike New World countries like Canada, Argentina, Brazil & the U.S., Bergonia has not received significant numbers of immigrants in the last 150 years. Few of the white people wanting to leave Europe during the 1800s and early 1900s were eager to go to a country dominated by dark people. There are no lack of people in so-called "Third World" countries who would move to Bergonia for work if they could, but since Bergonia's economy is not growth-driven, large numbers of immigrants are not needed. Thus, in modern times it has become extremely difficult to immigrate to Bergonia. Six official languages: Minidun, Nacateca, Pasan, French, English & Poretuguese. The language spoken by the most people is Minidun, and as a result Minidun is the first official language of the federal government. Congress, the executive council and the president all conduct their official business in Minidun, with a very important exception. The Importance of French: The foreign ministry and diplomatic corps long ago adopted French, since it is one of the two primary diplomatic languages of the Western-dominated world. The military also uses French as its operational language, and every soldier and sailor is expected to learn it. The military's choice of French dates back to the war of independence, when French colonists organized militias to oppose British rule. It was quickly recognized that the new republic's army and navy would benefit by adopting a single language. French was chosen because the organizers of the new republic included a great many French-speaking traders & bourgeoisie of the French-dominated regions of the north. The census generates numbers on language based on each adult individual's "first language" or "language-in-the-household" preferences. Minidun: 42.24% (72,272,000) of the people indicate that they speak Minidun as their first choice, which gives it a plurality over the other languages. Minidun is an isolating language, which means its words has little inflection, like English. Objects precede subjects, and verbs usually come at the end of sentences. Most basic words are one syllable, but a lot of concepts are expressed by compound words. Hardly any words have more than 3 syllables. Vowels are simple and crisp, with few diphthongs. Nacateca: 38.38% (65,667,000) speak Nacateca, a language with many vowels and diphthongs, but only 14 consonants (English has 23). It is an inflective language with agglutinative features, where sometimes a single complex word represents an entire sentence idea. Verbs can either precede or follow subjects. Objects must always follow subjects. Adjectives and adverbs are often capriciously paired in compound words to precisely or poetically modify nouns and verbs. Since the Prophet Ierecina was a Nacateca, Nacateca has always been the traditional liturgical language. Pasan: 5.0% (8,564,000) speak Pasan, likewise a heavily inflective language. Faroile: 1,0% (1,829,000) speak one of three Faroile languages in southern Bergonia. The Faroile languages are distantly related to Minidun, but after thousands of years of separate evolution, Minidun and the Faroile languages have little in common. Fishele: 0.3% (527,000) speak one of the three languages in this family, all among the scattered islands off the eastern coast of Bergonia, most within the state of Bunamota, remnants of the languages spoken by ancient Svegon islanders. English: 4.15% (7,099,000) They speak like a bunch of proper Englishmen. French: 5.63% (9,639,000), spread all over northern Bergonia. Portuguese: 2.4% (4,131,000) concentrated in Bunamota and Saldeia. "Swedish": 0.2% (352,000) These are the descendants of three Swedish and two Danish colonies that were planted along the Coninipati and Omaika coastlines. These settlements lost the protection of their governments when the French consolidated their control over northern Bergonia, but their communities persisted over the centuries, and now they speak their very unique language they call Swedish, a version of the mother tongue heavily influenced by Danish, French and Nacateca. Other Foreign Languages: 0.6% (1,035,000) Immigrants from various nations have created small language communities, nearly all in large cities. In a country with one main language, like the U.S. or Argentina, immigrants get more advantage out of abandoning their native language, but in a multilingual culture like Bergonia, the pressure is less, and so many of the immigrants typically retain their native languages for at least three generations. These primarily include (in order) Spanish, Italian, Yiddish, Greek and Arabic. 12.18% of the people primarily speak one of the three European languages. But all three are widely taught and understood throughout Bergonia. Bergonians do not regard a person well educated unless he speaks at least two languages fluently. Nearly all management level jobs, not to mention journalists, college instructors, doctors and nurses, police and security personnel, airport, hotel and restaurant work, all require "multilinguality." The first item on any Bergonian's resume is a statement of the languages he or she speaks and reads. The people at the very top of this society often can speak as many as four, five or six languages fluently. A country with six official languages requires a great number of competent translators. One takes tests to become certified as proficient in speaking and writing multiple languages and in translation skills. Good translators earn professional level pay. If Bergonia existed in the real world, thousands of Bergonian would be working in the US and around the world's translators. Foreign language instruction in Bergonia begins in kindergarten and continues at every level throughout school. This reflects the truth that foreign languages are most easily learned in childhood-- it is rather stupid for a school system to commence foreign language instruction years after the capacity to learn language has peaked. Every child in Bergonia, bar none, is required to study foreign language in elementary school. The best way of teaching foreign language at the advanced level is to teach other subjects in the foreign language. Most states and localities have more than one official language. Highway and traffic signs employ symbols & graphics rather than many words, most resembling Canadian road signs than any other nation's. Signs in cities, airports and train stations are multilingual-- in most cases written in all, or at east three, of the four major languages: Minidun, Nacateca, French & English, so it is not difficult for a North American tourist to get around. The country believes that achieving virtual zero population growth is a great success, in accord with its environmental revolution (the Greening). Many couples have two, three and four children, but many men and women do not have children at all. Birth control is legal in every state, and widely practiced. It is available to minors in nearly all parts of the country, though some localities are slightly more conservative in this respect. Abortion and Birth Control is not considered any sort of "constitutional right" in Bergonia (particularly since Bergonian jurisprudence requires a conservative reading of the constitution, according to the express meaning of the words used, with no casting of judicial "penumbras"). Attempts to amend the constitution to either allow or restrict abortions have all, fortunately, failed. However, as a matter of policy abortion is available upon demand during the first trimester in 23 of the 31 states, and in parts of 5 others. The constitution gives to local governments the authority to legislate morals matters, including abortion, and a few counties dominated by Christian, particularly Catholic, populations have limited abortion availability, even though first-trimester abortion on demand is legal in the remainder of the state (e.g. Simpetanti in the state of Bun-Vosuget). Only Pasiana, Giles and Omaika as a matter of state law limit abortion availability. Bergonia, like all other rich nations in the world, has seen a "graying" of its population. It had no post-WWII "baby boom" because it did not fight in WWII. Bergonia's "baby boom" came a decade earlier, after the Revolutionary War of the 1930s, which killed maybe over 700,000 men. Bergonia has therefore progressed further along the graying process than any other industrial countries. The national pension system has reached the worst ratio between workers and retirees, and is now leveling off into a more balanced relation between the generations. The term "atrei" refers to the native race or races, or to a person of native ethnicity. Native Bergonians-- the atrei-- are impossible to describe as a single race or type. One finds among the atrei a wide range of features and traits, but they predominantly have olive/brown/dark skin, dark eyes, dark hair that is either straight or wavy, and modest or flat noses. However, there are some native Bergonians with light skin and grey eyes who look as if they could be from Germany. For such a small area, Bergonia has always been ethnically very diverse. The pre-columbian population of Berg was far more diverse than the pre-columbian population of North or South America, more diverse than Europe, as diverse as Africa. he concept of race was never very controversial in Bergonia before the coming of the hyper-race-conscious Europeans. People in earlier times had observed and scrutinized differences in features and types, but by Tan times many people realized that there had been so much intermarriage that their ancient concept of race had become irrelevant. After so much intermarriage over the years, there are people speaking Minidun in eastern Bergonia who have Nacatecla features, and there are Nacateca speaking people in the west who have Amocla features. However even now one can still identify the three types, and people People do speak of someone having "Pasan eyes," a "Nacateca face," or a "Minidun chin." The Amocla "race." The name is related to "Amota," name of the eastern region where this race has always predominated, all the way back to Kuan times and before. Tall lean people with curly black hair, full lips, round eyes, modest sometimes flat noses, prominent chins, and long faces, and complexions ranging light brown to dark copper or dark bronze complexions. They are the original inhabitants of Eastern Bergonia. They are linked with the indigenous Guanches of the Canary Islands, the Berbers of North Africa, and populations on the south rim of the Sahara. They are presumed-- or guessed-- to have arrived from the Old World in small boats in some primordial time. Recent mitochondrial studies have suggested that three quarters of all people in Bergonia are descended from one common female ancestor with other descendants stretched from Mauritania to Greece to Somalia. The Faroi people of southern Bergonia, as well as most Minidun-speaking populations, are predominantly Amocla. The Nacatecla (like the language), an ethnic type closely related to Amerindians, originally occupied the western half of Bergonia, the half of course that faces the Americas. They have redder skins than other atrei. Many Nacateca men cannot grow full beards and have little body hair. The classical Nacateca face is wide, round or heart-shaped, with high cheekbones, a small straight nose, thin lips, and smooth features. The Nacateca people are typically a little shorter than the Minidun, the Pasan and European. The Pasan people resembling Caucasians, with olive complexions, gray and hazel eyes, and chestnut brown to jet black straight hair, and prominent straight noses. The one trait, however, that completely separates them from the Caucasians of Eurasia is their tendency for the epicanthal fold of the upper eyelid which is common in Asiatic races, and which virtually no Caucasians have. Pasans are thought possibly to be a Cro-Magnon remnant, pre-existing all other races in the entire Atlantic Basin, which of course presumes that Cro-Magnon had some sea-faring capacity. The mainstream of Pre-Columbian Bergonian civilization is largely the story of the Amocla and Nacatecla people, who for centuries shared the same Shufrantei religion and the same worldview. The far less numerous Pasans have always remained separate. Once upon a time they occupied most of northern and northeastern Bergonia, but they were pushed back and now occupy only the northeastern peninsular area called (rather unimaginatively) Pasiana. After Columbus's discovery of Bergonia, smallpox and other European diseases decimated the native population. From 1540 to 1620 the native population declined by almost 80%. French, English and Portuguese colonists settled in the coastal areas and lowlands. Their caucasian descendants thrive in Bergonia, so that now roughly 8% of the total population is white, while another 15-25% is sherei--mixed white and atrei. The current Black and Black-mixed population is 1,942,000, a little over 1% of the total. Although the European colonists found a large native population when they took over Bergonia, the English nevertheless imported slave labor from Africa to work in cotton and sugar plantations, primarily in what's now Serpia, Dhentamina and Soleinia. A great many of the black slaves however successfully escaped the plantations and fled northward from British controlled areas. Corifoi was one region in the south that resisted British control, and survived as an autonomous protectorate, so many escaped slaves found refuge there. Black slavery was abolished in the British colonies in 1810, and was never permitted in the independent Bergonian republic or in any of the autonomous states. In the late 1800s many blacks moved to cities to seek factory jobs. Blacks in Bergonia have suffered little from racism, except in localities firmly dominated by whites. The atrei generally accepted blacks into their cities and towns, though for many decades blacks tended to concentrate in their own neighborhoods, in conformity with the universal preference of people to settle with their own kind. Some states allowed local discrimination against black before the Mountain Cat Revolution in 1856, and some de facto discrimination continued afterwards by whites in white-controlled localities. But at no time in the independent Bergonian republic were blacks denied the freedom to move about, enter professions, write and publish, and amass property (at least not formally), and after 1858 the law was amended to allow the vote without qualification to all male adults. During the 1800s Bergonia developed a small class of black urban professionals, tradesmen and merchants, which grew and continued to prosper into the 1900s. Bergonia during the 1800s also became a favored destination for hunted black fugitives from the United States. This history has achieved a rather general distribution of the black population all throughout Bergonia, although the southern states-- the region once colonized by Britain-- have higher percentages. Corifoi has the highest percentage of black and mixed-black. Many blacks assimilated into atrei culture and now speak atrei languages; most of the remainder speak English. A significant number of blacks practice a syncretic religion similar to Santaria and Vodun, but a likewise significant number practice Miradi. (above & below) Two Nacateca men: wide faces & high cheekbones, thin lips & wide mouths, low, long noses, large eyes, straight or wavy black hair. (below) A Nacateca woman: flat nose, straight hair. (above) A Minidun man: long face, full lips, low nose, large eyes, dark, wavy or curly black hair. 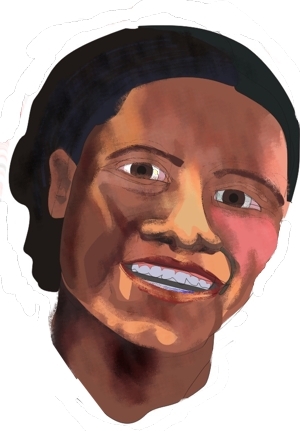 (above) Minidun woman, with lighter skin, plus characteristic low nose & full lips. (below) a Minidun man with a "Minidun jaw," which entails a cleft chin, plus Pasan green-hazel eyes & straight hair.